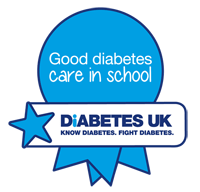 Congratulations to the Good Diabetes Care in School Award holders in the Midlands, Diabetes UK officially recognises that these schools deliver effective diabetes care and management. View the winning schools in the Midlands below, and to view the national winners go to ourhonour wall. I always feel my child is safe at school and on school trips. Communication between trained staff and myself is excellent and I am always informed of any issues, and I can always make contact if I have any concerns." St Michael's CE Primary School, Walsall. With our daughter only recently being diagnosed they have been supportive and very caring towards all of us as a family." She loves the school so much and admits she feels very safe there and is comfortable talking to her teachers." Well trained staff always look after my child. If there is some bad results (too high or too low blood sugar) they always come to us discuss about it when we pick our child up." I am very impressed with the carb counting by kitchen staff and teachers. This has put my worries at ease. Day to day care is fantastic! The school engage well with the diabetes team and plan in advance to ensure that children with diabetes are included in all school activities. When my daughter was first diagnosed the school showed her where everything was that she needed which helped her a lot. The best thing that this school provides is the excellent communication between the child, home and diabetes nursing team. The communication from the school regarding my son is amazing. The matron at the school has an excellent rapport with the children, keeps excellent records of blood glucose levels and any issues are dealt with efficiently. The school has also tried to set up a support group within the school for children with diabetes. They have truly gone above the call of duty. I am so glad we are able to manage my son's diabetes with the minimun disruption and maximum support. The school has good communication with the family and they have annual updates and take their role in supporting medical needs seriously. Since the day of diagnosis we have had the best support from the school, even at PTA events where the TA's purchase additional items and check on my daughter constantly to ensure she is safe, especially school discos. The school is keen to access education and support from the Diabetes team, takes steps to facilitate that the child has the same opportunities as any other child and ensures confidence in the child and family, that the child will be kept safe. The school show a real keen interest and she can totally rely on them on a day-to-day basis. The school have been very supportive with a number of children with Type 1 diabetes. The school provide a lot of support for my son; testing blood glucose levels, injecting insulin and keeping a close eye on him. They make sure he catches up on any work he misses due to his medical needs. Last year they had a non-uniform day in aid of Diabetes UK. They treat the child as an individual, never making him feel like he is a burden. Nothing is too much trouble and there is support from the head teacher right through to the support staff. The school embraces the use of technology that my son uses, he has had his pump upgraded and the staff work closely to learn and adapt to using the new pump. the teaching assistant are excellent. His control at school is good an so my son enjoys school and learning. The school annually incorporate diabetes awareness as part of the curriculum. There are three pupils with Type 1 diabetes at the primary school. All the parents have high expectations and the school is very capable looking after these children. The school issues my daughter with passes because of her diabetes which I think is a brilliant idea. The main first aider who cares for my daughter is fantastic and always keeps me informed. The school nurse updates care plans, call for advice if needed an raises any concern with us. She works with each pupil with diabetes separately, supporting them with insulin injections and pumps as needed. The school go above and beyond what is expected of them to make life both for my son and myself as easy as possible. Nothing is too much trouble, if in doubt they always ask and as a mother I know he is in safe hands. The staff have always shown a 'can do' attitude, this has meant reasonable adjustments and staff a have received training as needed. Nothing has seemed too much trouble and a partnership has formed between school, parents and the diabetes burses which works really well. The school do not allow Type 1 diabetes to become an issue in our son's school day. They are a most caring school, who on a daily basis astound us as parents as to how much they care for our son's wellbeing. The school comes to us with solution to potential problems before we are even aware they exist such as overnight stays. The school have been excellent at supporting both children in their care, moving forward with the independence on managing their condition within the safety of a supervised environment. I am very happy with the general care the school provide my daughter with. Both me and my daughter feel comfortable that we can speak to the school about diabetes and the care that is needed. My daughter is looked after well at school and is checked regularly and more when needed. The school has excellent rapport with our team. They are good at getting in touch and have continued regular training. There are great number of staff who help the student everyday. The student has a lot of confidence in school as the school is very inclusive and always thinking ahead to her needs. The best thing the head teacher and the school have done is everything! Faultless and by the book, they have made things easier for both me and my son. Staff are willing to listen and learn, to do their bit in understanding my son's Type 1 diabetes. The school welcomed the pupil back after his diagnosis with Type 1 diabetes and were eager to learn how to settle him back into school life. Staff have undergone training to care for the student. The school always try to come up with new ideas of how to help my daughter. The school is very supportive if the child with diabetes, ensuring all needs are met. Residential trips undertaken and the school ensured staff were fully trained so that the child could participate in all activities and not made to feel they were different. I am able to feel confident and sure my child will be in safe hands on a daily basis. This is something as a parent of a Type 1 child is so difficult to let go. This lets me go to work and don’t have to worry at all. More importantly my child feels confident and supported by the school. The school never let the child feel that she is different to the other pupils. They have 7 staff trained in day-to-day care, they have a Type 1 diabeets fundraiser, provide different carbohydrate options at lunch and read books on diabetes to the class. The staff of the school have provided excellent care for our daughter. The dedicated staff who care for her has taken the time to fully understand her needs and is able to manage all the needs whilst at school. All the other members of staff also provide good levels of care and we couldn't ask for more. Because the child is treated using pump therapy, the school were rigorous in persuing extra funding for having a one-to-one as the child's age meant that blood glucose testing and pump operation required far more intervention from school staff in day-to-day management, skills, knowledge and attitudes. They have continued this throughout the recent changes in funding for education and health, and continue to supply exemplary care for this child. The school give great day-to-day care, offer good communication, and complete a blood sugar diary everyday. Any problems and the school phone us. Our child has extra 1-1 times when school is missed due to appointments and have 3 trained staff when my child attended an overnight trip. They have made her feel included and never left out of anything. The school have worked hard with Parents and the Diabetes team to provide effective care in school. My child receives brilliant day-to-day care from the members of staff trained in her injections and blood glucose testing. They accommodate her needs and she is never excluded or made to feel different. We communicate well between ourselves and they adapt well to any changes. This positive attitude is the best thing the school can do to help minimize the disruption diabetes can be on her life. Extensive training to support the child in school is in place. Fantastic communication between the school and parents. Excelent plans in place. The school enable supportive attitudes from every member of staff at every level. They offered support at initial diagnosis. Nothing is too difficult - trips, out of school activities, residentials and the family is well supported. My son is extremely happy and confident at his school and has a fantastic relationship with the staff that look after his diabetes. Because of their care, my son is able to just be himself and not worry about his condition or feel different to anyone else. I have the confidence and peace of mind that my son is safe and that his diabetes is taken seriously and always dealt with whilst he's at school. Coten End have excelled themselves with the level of care they have given my son. Not only do they keep up with all the daily finger pricks, logging of information and insulin delivery, but the staff are kind, caring and understanding of his emotional needs, which can vary greatly, depending on his blood sugar levels. Coten End is very supportive and is the school that parents of children with diabetes want their children to go to! This school is amazing. They go out of their way to make sure they stay up to date with all that goes on with diabetes. They were fantastic with my daughter when she was diagnosed. The teachers learned how to inject my daughter and how to notice signs of low blood sugars. I know I can go to work knowing I can fully trust them with my daughter. The staff of the school have always taken diabetes very seriously. They have had more than enough staff trained and prepared to take after the children in the school with diabetes. They engage with the service and promote a good environment. The school has been amazing with my daughter. I'm really happy with how they are dealing with her diabetes. The school has given individualised care for a newly diagnosed child above and beyond what is usually provided. They changed care and staff to meet the child's needs and aided in improving the child's independence and ability in relation to diabetes. They are warm and sympathetic and make her feel brave and encourage her so much. I feel 100% comfortable with them taking on the daily challenges that Type 1 diabetes often throws at my daughter. They are keen for training and education. They make the student feel at ease in school. They allow her to participate in all aspects of school activities. Diabetes does not stop her. As well as receiving good care at school, the staff also help maitain her dietery requirements and they count the number of carbohydrates in every meal. They are probably, in my opinion, the most organised school whent it comes to lunchtime routine for all diabetic pupils. The routine makes the whole process simple and seemless for the children and allows them the freedom that the none diabetic pupils have. The school has gone above and beyond to make sure that Allie's diabetes does not effect his learning and because of this he is thriving and enjoys coming to school. Allie is included fully in the school curriculum and his diabetes is never used to prevent him from being included. The school has recognised that my son should not be defined by his diabetes and that diabetes although a major part of his life should not be at the forefront of who he is. They have taken steps to build his confidence and to take focus away from thinking he is just a boy with T1. The school has ensured that the pupil with diabetes is able to engage in all schools activities and clubs. Darley Churchtown is more than a school, it is like a family. Everyone knows each other and cares about each other. While caring for my son's needs, I am also aware he is treated the same as the other children, which is so important for his mental well-being. School have fully taken on board what it is to have a child with diabetes within their pupils. All the staff have been trained who work with the boys on a day to day basis and really give parents confidence when leaving their child at school. From day one they have been supportive. When I leave them at school I go home feeling happy and confident that they are safe. The school fully support the children on a daily basis and keep in regular contact with the diabetes team to ensure up to date care. All the teachers have been amazing in keeping me up to date daily on his blood levels and making plans with me to calculate carbs for any food or food related projects during school so that my son can join the same as all the other children. The school has included the child in all activities. He has not been made to feel different in any way to the other pupils. All care and treatments are done discretely. The school has been more than supportive. They go beyond and better than any parent could have expected. Care is given in an individualised and caring way. Everyday help and support for her is amazing. Puts my mind at ease knowing she is in such great hands. The staff is highly committed and compassionate in regards to the care and support they provide. The school goes above and beyond. Mrs Sands always makes you forget about how bad diabetes can be. It is always fun going to Mrs Sands as she really cares and looks after us. We feel assured that the children with diabetes will be monitered and managed, without exception and without concern. She is always included in all activities. Staff take the initiative to ensure her levels are as good as possible. The school always contact us if in need of advice and support.